The Syncfusion Essential Studio for ASP.NET MVC Visual Studio extensions include project template, scaffolding, conversion, and migration tools. 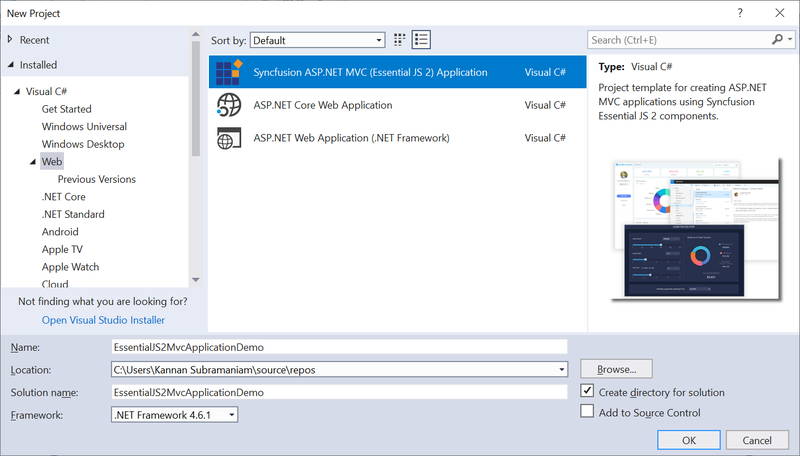 The Syncfusion Essential Studio for ASP.NET MVC extensions for Visual Studio allows you to create a ASP.NET MVC project using a pre-built template. The scaffolding for Syncfusion ASP.NET MVC helps quickly add the code that interacts with data models of the Syncfusion components. Over 65 high-performance, lightweight, modular, and responsive UI controls in a single package. User-friendly and easy to configure the ASP.NET MVC projects with Syncfusion control references (NuGet packages - Automatically downloaded from NuGet.org and no installer required). 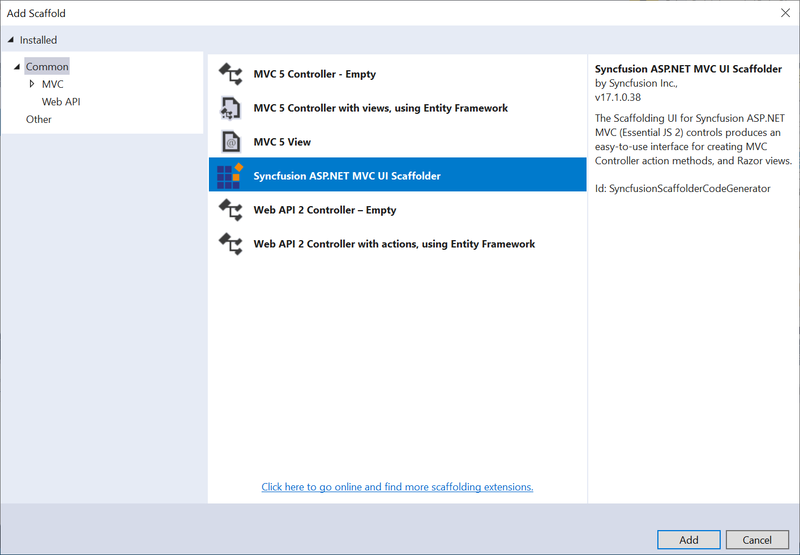 The Syncfusion ASP.NET MVC extensions install the pre-built template with Visual Studio. 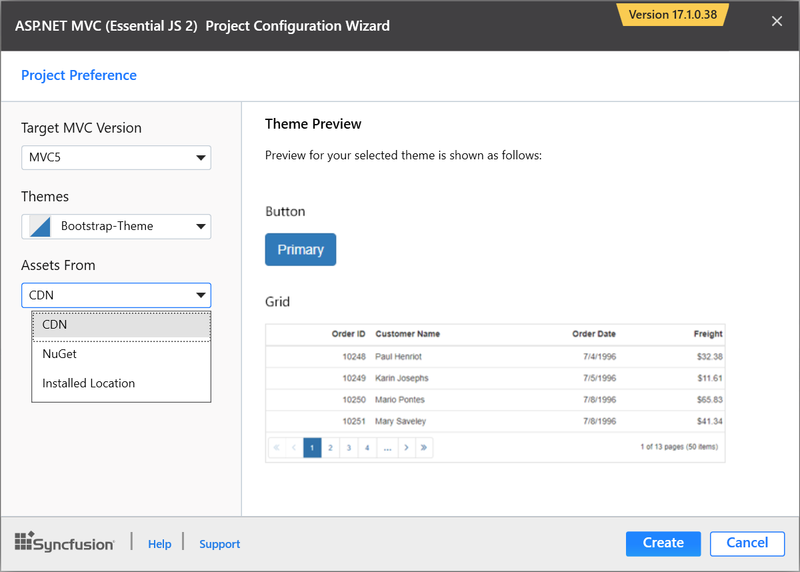 This project template allows you to create a new ASP.NET MVC project with the required Syncfusion references, and then use configurators to customize the projects by selecting the ASP.NET MVC version, themes, and assets from CDN, NuGet, or setup installed location. These templates provide a starting point for users to begin creating projects or expand the existing projects. To learn more about the project template, refer to this documentation. 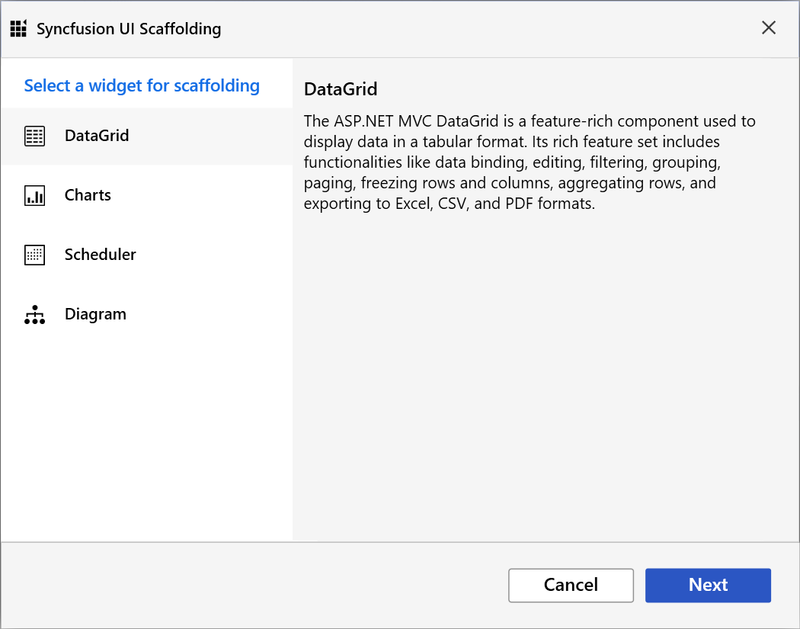 Scaffolding provides an easy way to create Views and Controller action methods for Syncfusion ASP.NET MVC DataGrid, Charts, Scheduler, and Diagram in an existing ASP.NET MVC application. 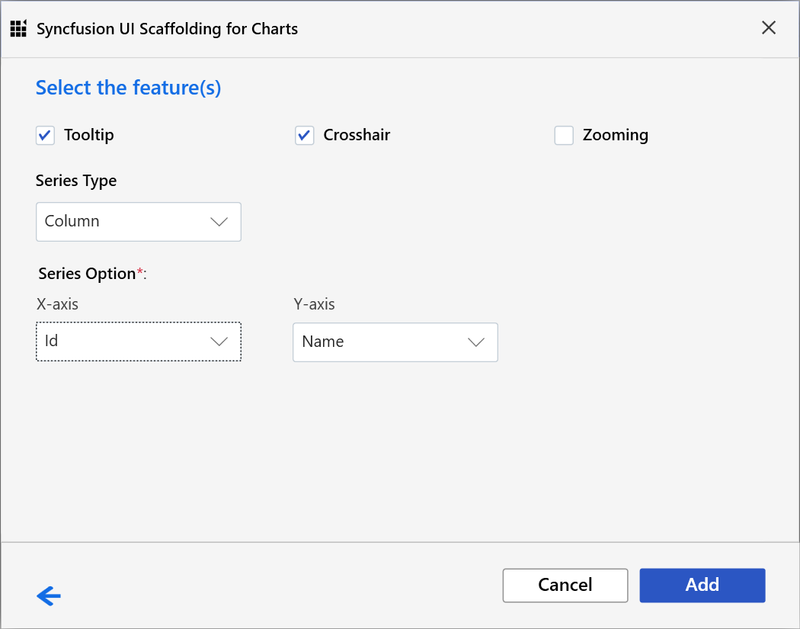 The scaffolding UI collects Syncfusion component features and the data field for the selected control, and this can reduce the amount of time taken to develop standard operations. To learn more about scaffolding, refer to this documentation. Project conversion is a Visual Studio add-in that converts an existing ASP.NET MVC application into a Syncfusion ASP.NET MVC Web application by adding the required assemblies and resource files. Note: This feature is currently available only in Syncfusion Essential JS2 ASP.NET MVC installer. Try this link to download the ASP.NET MVC Installer. To learn more about conversion, refer to this documentation. Project migration is a Visual Studio add-in that allows you to migrate the existing Syncfusion ASP.NET MVC Web Application from one Essential Studio version to another. To learn more about migration, refer to this documentation.